Goodbye Kindle Unlimited – Hello iTunes and Kobo! If you haven’t seen this elsewhere, here’s an announcement of note: The Monkey Queen books will be leaving Kindle Unlimited when their current term expires – March 17 for Redblade, March 4 for the others. They’ll still available to buy at Amazon, but they’ll no longer be free to read for Kindle Unlimited members. I’ve made this decision because I think that interest in Michiko and Beth has grown enough where I’d like to make the books widely available again. If you’ve been reading the books through Kindle Unlimited, I hope this isn’t an inconvenience and you’ll continue to follow the series. If you prefer other e-stores to Amazon, however, you’ll soon be able to get the Monkey Queen’s adventures at Kobo, iTunes, Barnes and Noble (for Nook), Drive-Thru Fiction and more! We’ll update the “Where To Buy” links as the changeover takes place. And stay tuned – we’ll have more exciting news coming soon! 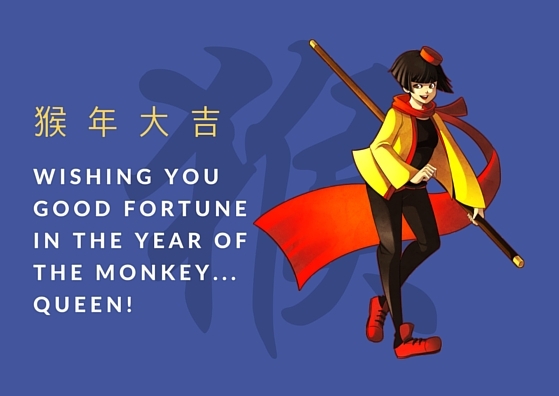 Let’s make 2016 the Year of…the Monkey Queen! Willow Wednesdays: Happy Birthday, Willow! Art © 2016 by Willow. All rights reserved; used by permission. You can view Willow’s extensive galleries on DeviantArt and Tumblr, see her updates and works in progress by liking her Facebook page, follow her on Twitter, and buy prints and much more at her Society6 webstore, including exclusive Monkey Queen items! 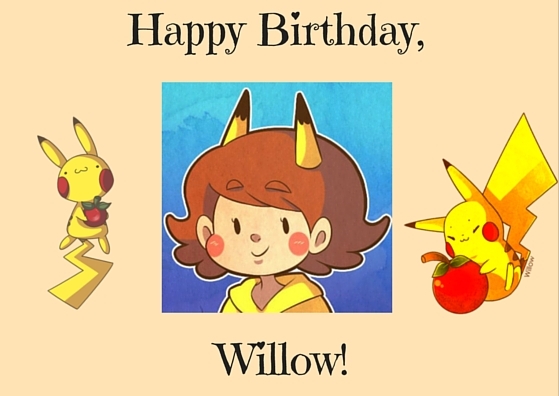 And Willow, if you’re reading this on February 10, Happy Birthday! Two things to get your Tuesday rolling. First, I forgot to mention that The Doubleclicks, our favorite sister geek-folk-rock-with-cat-keyboard duo, are holding a live streaming concert this coming Sunday, Valentine’s Day! Well, technically it’ll be at midnight GMT and 1:00 AM CET, but it’s on Valentine’s Day in the Western Hemisphere – 3:00 PM Pacific, 6:00 PM Eastern. There’ll be songs about love, dinosaurs, geeky fun things, and more! It’ll be on YouTube; click here to watch, or here to learn more about the band. See you there! 2016…the Year of the Monkey (Queen)! Wishing of all you a Happy Chinese New Year! It’s 4714…the Year of the Monkey. Things are off to a slow start this year for Michiko and Beth, but it won’t stay that way for long. Enemies are waiting for them. They’ll greet old friends and new, and adventure in new and familiar places. By the time this year is over, Michiko and Beth will have faced their greatest challenges, confronted their greatest dangers and fears, and will celebrate their greatest triumphs…if they survive. In the end, 2016 will be the Year of…the Monkey Queen! Stay tuned! Art © 2016 Willow; used with her kind permission. Designed by Robert Dahlen on Canva.com.